In this season of Christ’s incarnation, CC.com profiles individuals who have become neighbours of people in Vancouver’s Downtown Eastside. 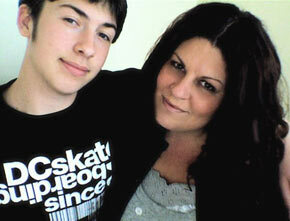 Trista Parry, pastor of The River, with her son Jess. The River is a merge of The Street Church, which had served at Hastings and Main for about 15 years, and The River Community Foursquare Church, a church in her home close by. But unlike a regular church, Parry and her core group of about 20 do not hold Sunday worship services and try to avoid anything structured as much as possible. And they are not the only ones who have experienced the same call – far from it. Jen Ziemann has lived at St. Chiara, a cooperative community, for 16 years. She and the two growing families and the others who all live under the same roof were among the first to be led to incarnate Christ among some of the most destitute people in Canada. From the start, they have prepared evening meals that anyone in the neighbourhood is welcome to share with them. They do that four days a week. “It’s a very encouraging thing for people, I think, to know that we’re here for you and you’re welcome to become part of our big family,” says Ziemann. Since the age of one, Hannah Walker has lived across from Oppenheimer Park, in the St. Chiara community. 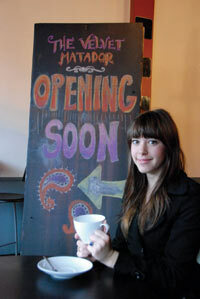 She is just about to open a coffee house "The Velvet Matador" around the corner, at 508 Powell Street. Steve Rathgen with the Servants Vancouver community in the Downtown Eastside believes sitting around a dinner table is one of the best ways for people to experience God’s love. 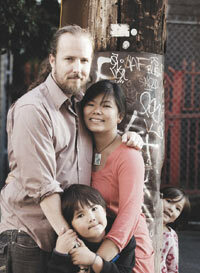 Craig Greenfield and his wife Nay lived incarnationally in a Cambodia slum. They have lived in the Downtown Eastside for the past several years, as part of the Servants movement. “I view it as one way of being in solidarity with those Jesus especially sought out,” Servants Vancouver co-founder Craig Greenfield wrote in an email from New Zealand. “It’s impact through contact,” adds Aaron White, a Salvation Army officer with Corps 614 Vancouver (the number refers to Isaiah 61:4) who moved with his wife and children into the area five years ago. 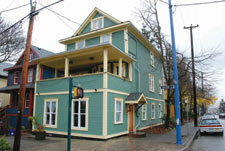 It is a welcoming, open-door policy that larger, established organizations in the Downtown Eastside have also adopted. Long known for providing everything from meals to help in writing a resume, First United Church Mission now invites the homeless in to sleep in the sanctuary. Each night, 240 people on average take up the offer. UGM president Bill Mollard says many of their rehab 'grads' continue to live and work with them in the Downtown Eastside. 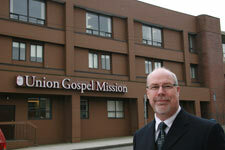 “It’s woven into the fabric of who Union Gospel Mission is – ‘God, what are you doing today? Now help us to be part of it,'” he says. However, White insists it is impossible to be truly incarnational to the people of the Downtown Eastside without also being physically present among them all the time. “It’s fairly easy,” he says, “to come down and see what’s not good about this neighbourhood, because everything’s on the surface. Matthews says building trust protects the dignity of those in need of help, by not forcing them to act against their will. He compares it to the two approaches to suicide prevention. “Agencies that are into saving lives will go out and if necessary trick you into not jumping and being helped. The problem with that is often a week later the same person is out there trying to do the same thing again. For some in the Servants Vancouver community, living in the Downtown Eastside is also a way for them to transition to living among the poor in other parts of the world. “Servants Vancouver is a local attempt to live out the charisms of Servants, the international movement. We wanted to blur the traditional lines between home and field and in missions, and live out the calling God has given us in a Western context,” Greenfield wrote. But neither have groups avoided adding in some structure when necessary to meet particular needs. 614 Vancouver oversees the War Room, a place where prayer takes place virtually around the clock. And St. Chiara now runs a low-income housing project, renting out rooms in four adjacent houses to people on welfare. Yet nothing can substitute for the deep friendships and the trust that have been built up over the years – and nowhere has God’s blessing upon their labours been more evident. “Honestly,” White admits, “the only real significant success that we’ve seen with people coming out of a lifestyle of serious addiction or prostitution or whatever, is to say, ‘Come and live with us. '” Some, he says, now work at shelters and at other places in the area. Mollard too reports a “very high rate” of people who have gone through UGM’s drug and alcohol recovery program, and who accepted Christ in the process, are now themselves living incarnationally in the Downtown Eastside. “We’ve got people who’ve been on the street for 20 years who now work for us,” he says. In fact, Rathgen says one man who came out of UGM’s recovery program, and who has lived with Servants for the past two years, now feels called to Cambodia. He plans to leave in July. And of the 100 or so people who have lived with the Parry household over the years, Trista Parry is affirmed by the fact that all but two have come to believe in Jesus. At the heart of living incarnationally, Ziemann believes, is Jesus’ command to love God and love our neighbours as ourselves. “It gets complicated in terms of the struggles and the pain people have and walking through some of this with people who’ve been abused and abandoned and rejected, who are in addiction and have mental health issues,” she says.